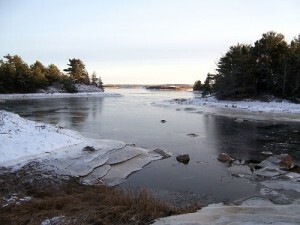 We’ve had quite a long cold snap, and the ocean ice in and near our inlet is way over 6 inches thickness, the recommended thickness for safety. 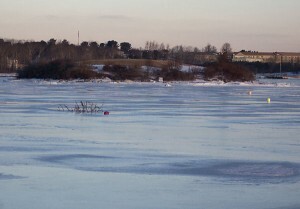 Beautifully smooth too, in places, though the wind chill discouraged us from going back for our skates. 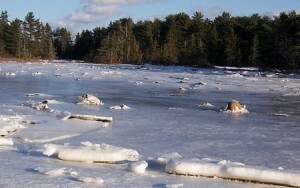 At low tide, the ice is sitting on or near the bottom, so there’s little risk. 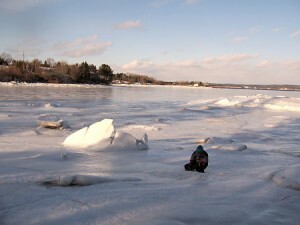 It’s harder to get onto the ice when the tide is higher, as the broken pieces around the edge may not bear one’s weight, as my son learned this morning! No harm done, just wet boots and an uncomfortable trot home. 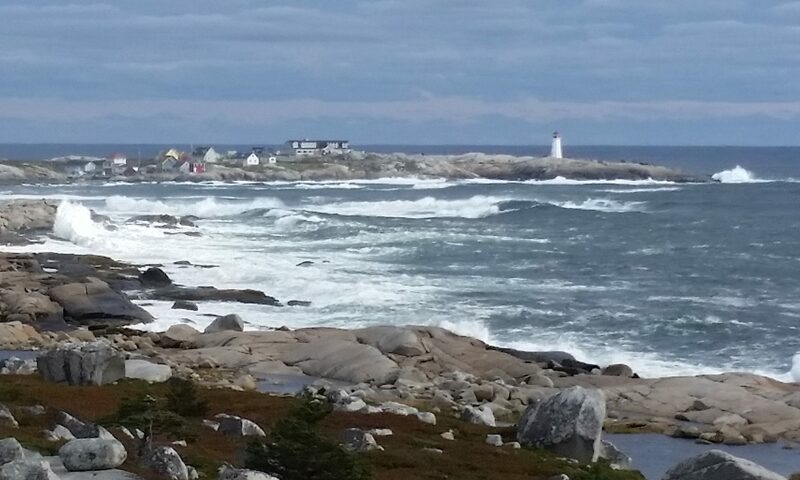 The big rocks in the middle are barely underwater at high tide, and we have to avoid them when rowing or paddling in the summer. Some new photos added: I was very pleased with the photo of the church in the Grand Pre National Historic Site that commemorates the expulsion of the Acadian settlers of Nova Scotia by the British in 1755. There is also a moving set of bronze statues of an Acadian family that makes you wonder if they’re all going to get on the same ship. Many families, tragically, were split up. Derek Hatfield is looking for crew! Got some serious cash and top-notch sailing skills? Want to sail the Southern Ocean in a very fast, well-equipped boat with an experienced skipper, take her round Cape Horn and up the South and North Atlantic to France? Does Derek Hatfield have an opportunity for you! Stranded in Tasmania after broken spreaders on the Open 60, Spirit of Canada, forced him to quit the Vendée Globe round-the-world solo race, Derek has been repairing the boat, but can’t afford to pack her in a crate and ship her back. He has to sail her. And this is where you come in – if you can outbid your competition, that is. Go for it! Get details on the Spirit of Canada website. 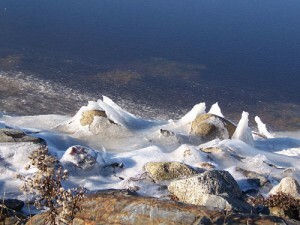 Momentous events leave nature cold? After yesterday’s grand celebrations in Washington, and us watching on TV with much of the rest of the world, the ice and the sea were still there this cold morning. The frigid air knew nothing of rarefied oratory or high expectations, of the helicopter that had spun a departing president into the sky, and the ice had not heard of the new one – the president of the world, no less – who magically came into power at precisely noon while listening thoughtfully to Itzhak Perlman and Yo-Yo Mah’s divine music. The ice floating on the sea, like the air suspended above it, just was. But if a butterfly flapping its wings can alter events far away in space and time, perhaps this ice is not exactly the same as it would have been had yesterday been less auspicious. And if we cannot observe things without changing them on some microscopic level, then because I am thinking these thoughts, the morning has been made different just by my presence, by the same mechanism that Barack Obama’s inauguration has changed the world. I am reminded of a woman I met in a Nigerian market who spoke of how much better life had been under the brief regime of a certain president a few years before. She said that in those days, “I would go home from the market and make better soup.” Seasoned with a dash of optimism and happiness, the flavour of ordinary, mundane ingredients can actually be improved. Lastly, I recall reading some time ago how the culture of government in the US had spawned a sort of anti-intellectualism: it wasn’t cool to be smart. Is that like the old custom of not standing higher than the king? Let’s not be smarter than the president? How disastrous for a nation! I predict a change in that regard, folks. So don’t hide your light under a bushel. This world needs all the smarts it can get. I just added a few photos of The Ovens, near Lunenburg, that my mother took last summer. More new pictures to come! Derek Hatfield is in Hobart, Tasmania, Australia, having carefully piloted his Open 60 sailboat, Spirit of Canada, to the closest shelter of land after the boat was damaged in the Vendée Globe solo, non-stop, round-the-world sailing race (“the Everest of sailing”). Spirit of Canada had been hit by a huge wave that knocked the boat over and broke the spreaders high above the deck. The race’s rules require that participants repair any damage without any outside help if they are to stay in the race, but this damage is not something that Derek could have repaired alone. In fact, of the 30 boats that started this race 50 days ago, only 12 remain in the running, so he is in very respectable company. A look at the race’s map (see www.vendeeglobe.org/en/ and click on the Map) shows the southernmost points of land littered with boats that have had to abandon the race. “Spirit of Canada” has been a shoestring project all along, without the major corporate sponsorship and intense media interest enjoyed by Derek’s European competitors. The whole enterprise has been built on the small donations of thousands of Canadians. Now they have to get the boat back home to Nova Scotia, and fixed so it can participate in future Open 60 races. Shipping a boat like that is very expensive. However, sailing it home would require that it be fixed first, which has its own logistical challenges. If you can help support “Spirit of Canada” with a financial contribution, please do so. You can make a donation via their website, SpiritOfCanada.net, and send supportive e-mails to Derek from there as well. 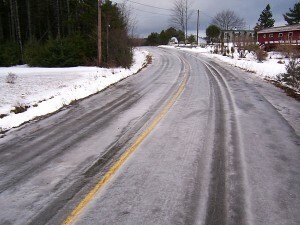 Schools were cancelled due to road conditions like this. Icy and completely slippery, treacherous just to walk on. I could have skated. 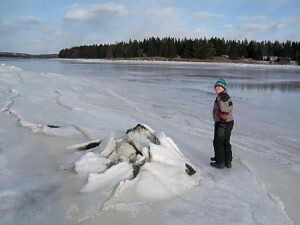 Later in the day the ice had melted and run off into the ditches – in most places. 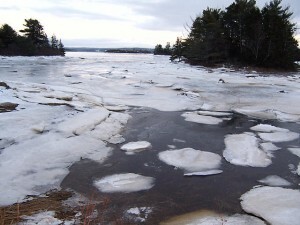 Ice always builds up and stays in the inlets where it isn’t easily carried out to sea. At low tide it just sits on the bottom, on the mud. There’s always a dynamic edge out there forming, melting, breaking off depending on the wave action, with pieces getting carried out to sea. I’ve just added a new section called “Fundy Shore” with some photos my mother took of the Joggins cliffs which are full of fossils and home to a popular museum. Also there are some new photos of Lunenburg, notably of Bluenose II as, loaded with passengers, she gracefully left her berth and headed out to sea, absolutely dwarfing the other boats, including ours, that were moored in the harbour. There are also a few new pictures in the Panoramas section. The temperature has been bouncing around like a yo-yo – rather like the price of gas, from minus 10 degrees C to plus 10 and back again within a few days. Unlike fresh water, which is at its most dense around 4 degrees C, salt water is most dense at its freezing point, which is typically around minus 2 C. The more salt is in the water, the lower its freezing point. In oceans that freeze, the water deeper down is saltier, so it stays down, and is less likely to freeze because the high salt concentration lowers its freezing point considerably. The lighter, relatively fresher water stays on top – so it’s more likely to freeze, and when it does freeze it has little salt in it, as I found out by tasting it. 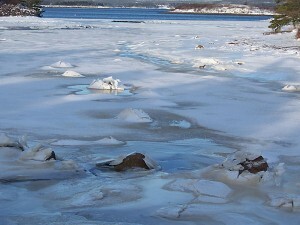 Ice that formed over rocks at high tide, then bent and cracked as the tide fell - December 14.